If you are a WordPress user, then a forum on your website can be one additional feature for the users. The forum allows visitors to communicate with each other while anonymous users can also share their views over the website. These forums are related to different topics like teaching, automobiles, technology and many more. Forum also helps the user to search for different topics. Moreover, a forum increases your web presence and boost your online brand. It is the best way to establish a relationship with users and other growing industries. In this article, I will tell you about the Top WordPress Forum themes which can boost your website and online presence. If you are looking for themes like Yahoo answers or Quora then Question & Answer theme can be the best answer for you. The powerful Q&A theme is loaded with different features and is very easy to install. The key features of this theme are user can ask questions. Ask a Question is an integral part of this theme where the user can ask question-related to any niche. Vote on Answers, both user and owner can vote of different answers. You can even set a price for question submissions, where the theme will charge the user for a per question. You can translate the answers in any language; you will also get a powerful dedicated blog section in this theme. It doesn’t matter you have non-profit or business website; this theme can be easily used. It is also compatible with WordPress plugins. If you don’t have any knowledge of coding then also you can easily set-up and use this theme. 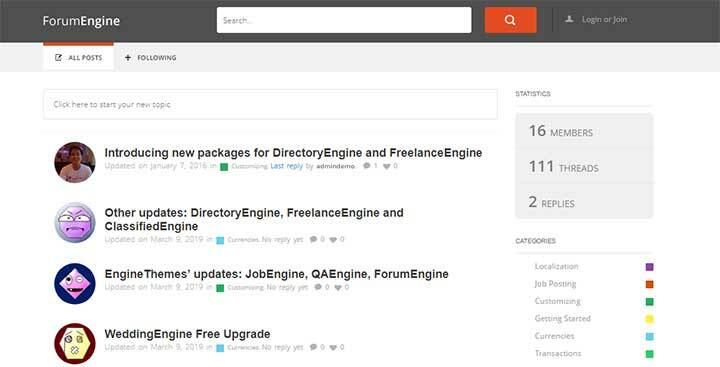 ForumEngine is highly customizable and powerful WordPress forum theme. You will get style customizer where you can change the style and appearance of your homepage. You will get front-end controls by which you can easily edit and publish your content. This theme has an adaptive design because of which your website will look stunning in different devices. ForumEngine has user badge system by which you can assign different badges to users. You will get a live notification system by which you can update your user for any live action on your website. Engine setting option of this theme will allow you to manage all the information on the website very easily. The ForumEngine theme comes with 12 months of free updates. Ideas WordPress theme is the productive WordPress forum theme which allows you to interact with users and engage more users. The main Focus of Ideas theme is to reduce the communication gap. If you have a profit or non-profit website, Ideas theme can be installed very easily. This theme has different features like customizable email notifications, back-end panels for different idea management. You can create unlimited categories where the discussion and comments can be done very easily. This theme has a dedicated blog section where you can showcase your business and services. Ideas theme is SEO friendly which promotes good google ranking. You will get multiple color scheme, multi-language support, responsive design, flexible widgets, clean code, transferable license, admin reset votes, and many other features. The administration of this theme is very easy even if you are not a coder then also you can easily install and manage this theme. 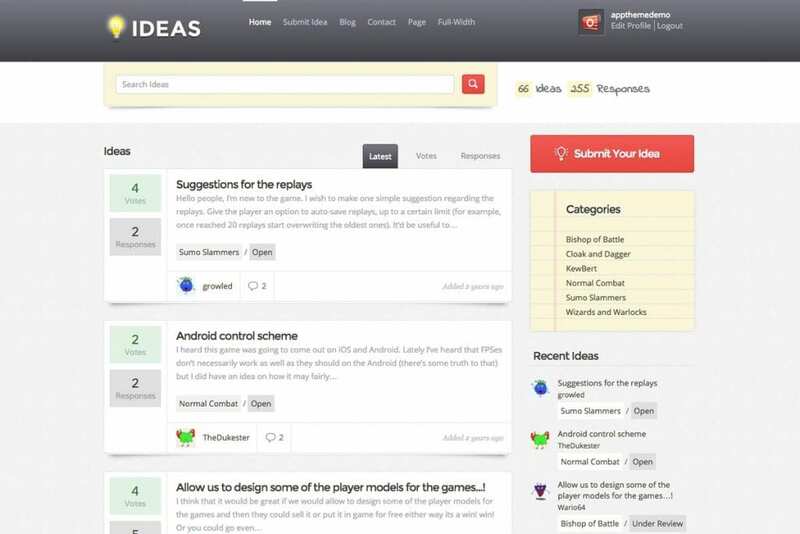 The QAEngine theme allows you to create fully functional question & answer WordPress website. This WordPress Forum theme gives a clean design and user-focused experience. The QAEngine theme allows you to build a community on your website. The user can freely ask different questions and can receive the best answers. By using Premium Pump feature user can pay and put their question at the top. Pump feature of this theme can help you to generate money. You can also assign a badge to users for their best answer and question. This theme is fully responsive; you will get a high definition view of your website in any device. The QAEngine gives you other features like question tags, question filters, anti-spam security, social login, various email templates, and live notification system. The QAEnigne theme is straightforward to install and use even if you are non-coder then also you can use this theme. 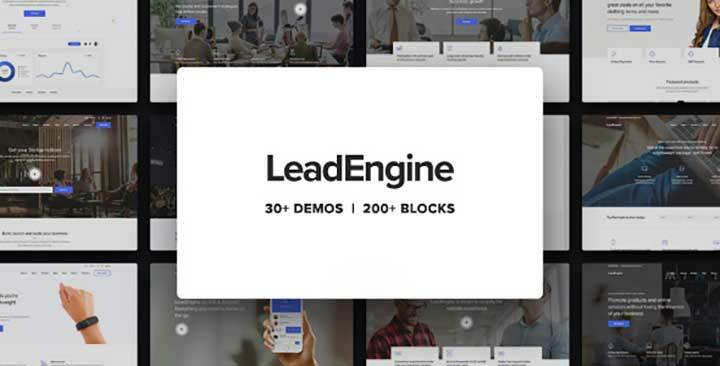 The LeadEngine theme has 35+ build in websites which you can use for creating a digital agency, event, marketing, educational, hospitality, and many other websites. The LeadEngine theme has impressive features like it has premium plugins installed. The user will get a powerful visual editor and different icons pack. This theme is fully responsive over the different devices. You can quickly start your online store just by installing this theme. If you are looking for a complete blogging website than this theme will give you complete support and accessibility for a blog-based website. The other features of this website are 200+ templates block, child themes, complete documentation, lifetime free updates, easy customization, and smooth user experience. Woffice is rich and powerful multipurpose WordPress theme. This theme is inspired by google material design which gives a modern and classic look to any website. This WordPress Forum theme has self-hosted intranet and extranet WordPress solution. You will get other features like project manager by which you can manage all your business files and task at one place. You can also enable slack notification in your website. The user will get member dashboard option where you can display any widgets you want. You can extend the performance of your theme by different plugins. When you are looking to build your community, social network, school intranet, and member logins then use Woffice WordPress theme. 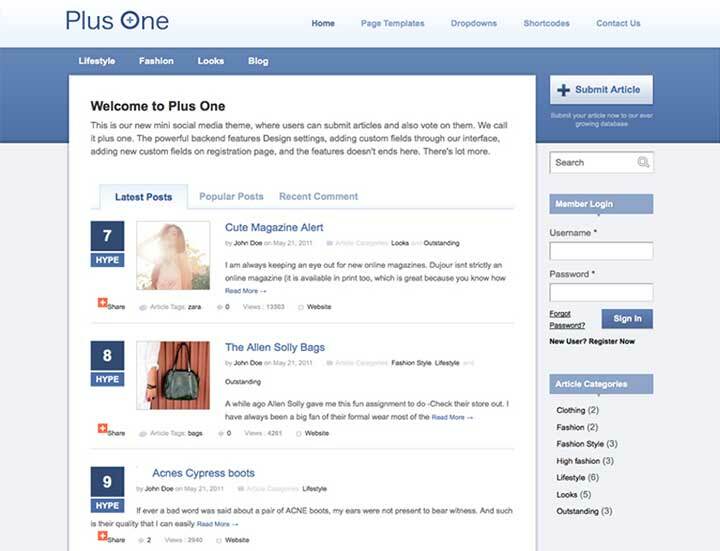 By using PlusOne theme, you can create a small social media support site. This theme can be easily installed on your website with the auto-install feature. This theme gives a strategic design to your homepage with dynamic widgets. The user can easily submit their articles with different image and video options. You can control different elements of this theme like the style, colour, font, and body without even touching the body. The PlusOne theme has inbuilt seven pages templates, custom widgets, drop down menu, theme guide, and multiple use license. The PlusOne theme is one of its kind, it will give a clean and attractive display to your webpages. If you want communication section in your profit website then also you can use PlusOne theme. 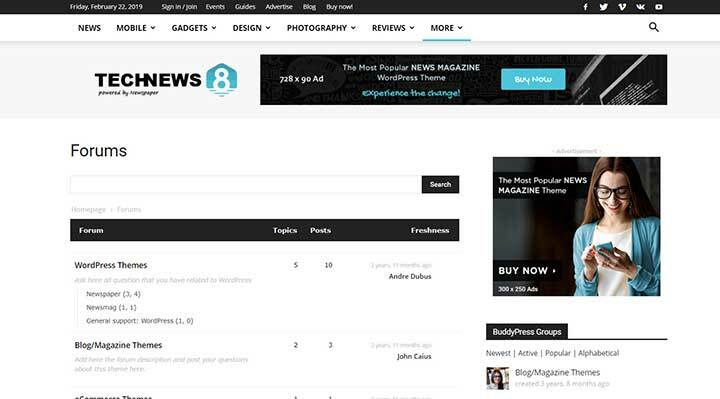 ForumPress is bbPress forum theme for WordPress. You can create a fully functionally forum by using this theme and offer Q&A support to your users. This user support theme is powered by the bbPress plugin by which you can enjoy different functionality. 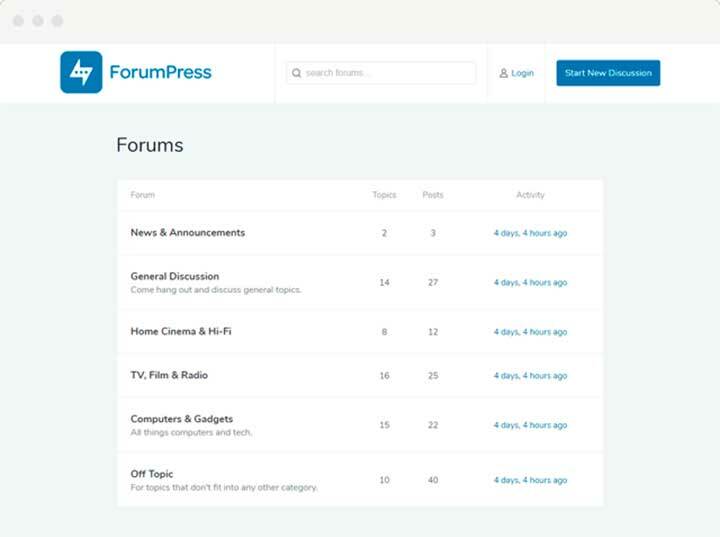 The ForumPress theme supports multiple forum where you can manage different topics. Every user on the website can have a dedicated page where they can display all their information and blogs. The live search feature of this theme allows the user to search for any content from the website. 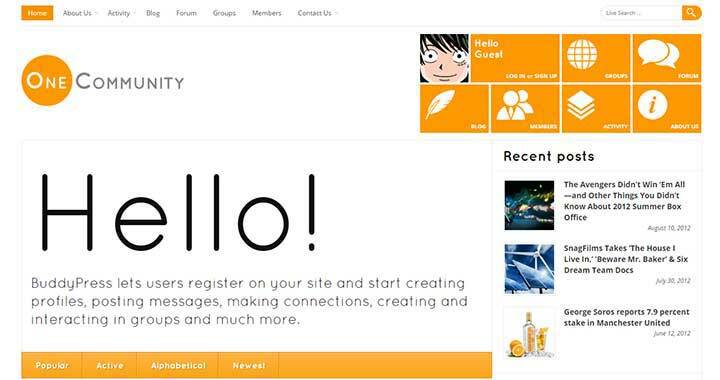 The forum on your website will reflect your brand and company name by using ForumPress theme. This theme has online documentation and automatic updates. Don’t worry if you are non-coder then also you can install and manage this theme. Looking for knowledge-based website and support forum Tikidocs is here for you. A user will get a live search option where they can find anything in just a few seconds. The Tikidocs gives you revolutionary slider option by which content is displayed beautifully. In the custom admin page, you can edit the layout and design of your page. The best thing about this WordPress forum theme is you can change the layout of the page without touching the codes. The other useful feature of this theme is 600+ google fonts, eye-catching animations, multiple headers, different custom widgets, and regular updates. The KnowledgePress theme can help in building the best customer service related website. If you are looking for a website with different FAQ and Forum pages, then KnowledgePress will give extensive options. The other impressive feature of KnowledgePress WordPress theme is drag & drop article category where you can keep a record of your articles. By using FAQ plugins, you can create multiple FAQ pages. In the live search option of this theme, the user can disable live search result. Voting feature in this theme will allow the user to create both public and member voting over the websites. The user can choose from hundreds of google fonts. Ask Me WordPress theme comes with different question pages, modern user pages, and badges and point system. Ask Me theme has the ultimate question page layout where you can divide questions according to different categories. Any user on your website can easily create his profile and ask questions. 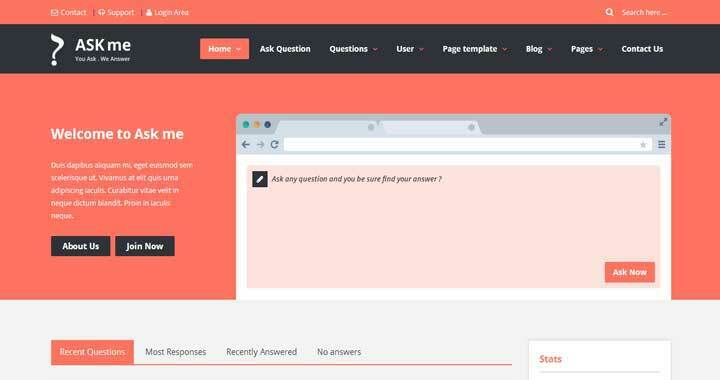 The Ask Me theme allows the user to create an online poll in just a few steps. You can pick the best answer and award it different badges and points. You can manage all the database of the website on front-end without editing the codes. This theme has like & dislike feature by which user can vote on question and answers. The Ask Me theme has unlimited colors and styles with the enhanced user experience. This theme is responsive-ready and retina display ready. One Community is the ultimate theme for any online community. This WordPress forum theme has a modular layout through which you can change the layout of from page without touching the codes. One Community supports some plugins by which you can create e-learning platform and business platform. You will get private messaging system through which you can interact with different users. You will also get different blog styles with nine colour options. You can easily import the demo just by one click. If you are not aware of coding and website development then also you can easily install One Community theme and manage it without any trouble. Jannah is one of it’s kind WordPress theme. It has all new layout and a responsive design which gives an outstanding look to your website. Jannah theme comes with GDPR Compliance Support. You can create any type of website by using Jannah WordPress Forum theme, like hospitality, fitness, travel, and many more. Jannah will give all new style to your block section; you can even also upload your fonts to give a new style to your blogs. The Jannah is the first theme which gives migration plugin by which you can import your website without any loss of data. Buddy is a modern, lightweight and fully responsive bbPress & forum WordPress theme. This theme can be used for any type of websites as a business, corporate, community, social media, hospitality, fitness, travel, education, and many more. 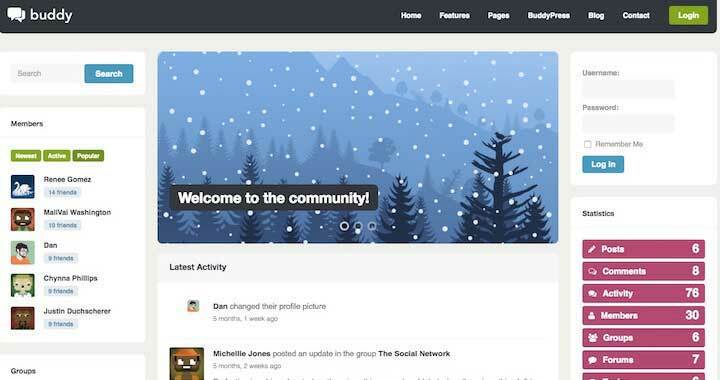 The key feature of this theme is it has BuddyPress integration so that you can create any social community. You can install Buddy theme just by one click, it has more than 400 icon fonts which can give new look to your website. Buddy theme has built-in search engine optimization and translation ready. Whether you are coder or non-coder you can easily install and manage Buddy theme. Sahifa is a user-friendly, clean, modern, flexible, fast loading and fully responsive WordPress theme for blogs, magazine, newspaper related website. This support friendly theme has an amazing powerful admin panel where you can change all your settings and layout of the website very easily. 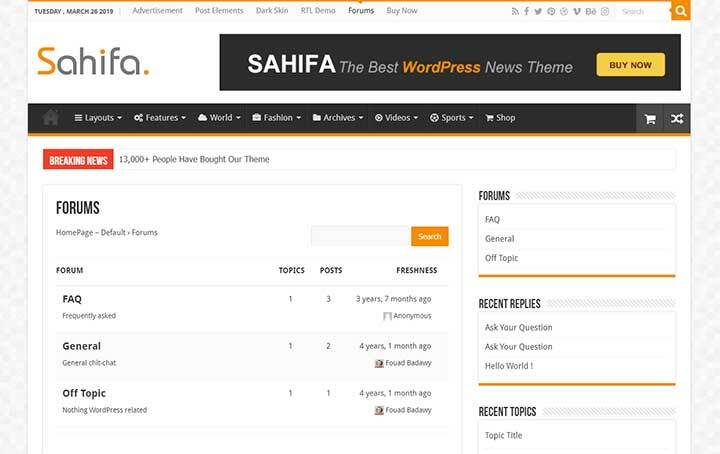 Sahifa theme is fully compatible with BuddyPress plugins and bbPress. TiePage Builder option of this theme has a drag and drop option by which you can create multiple homepage layouts. You will get social media widgets which makes sharing easy. The home page slider of this theme comes with different options like animation, query and slide time. You will get a dedicated Instagram widget and weather widget in Sahifa WordPress theme. If you want to write your article with ease and display your content effectively then Newspaper WordPress theme is for you. This is one of the best selling WordPress theme for news, blogs, or review site. Newspaper theme is integrated with BuddyPress, bbPress, WooCommerce, and Instagram. You design everything in the front-end by using Newspaper theme. You will get more than 420+ ready to use templates for your website, Newspaper theme only loads important contents and eliminates unnecessary content from your website. So if you are looking for a modern website which is flexible then use Newspaper WordPress theme. Any Other WordPress Forum Theme? 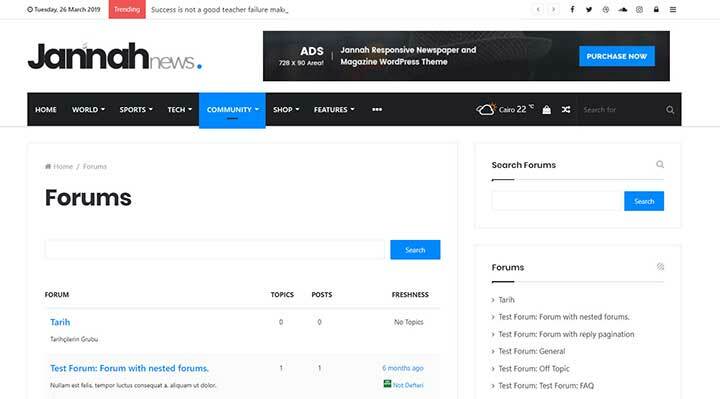 This article has detailed information about different WordPress Forum themes of 2019. All these themes are very essential to grow your business and online presence. So by reading this article choose the best WordPress Forum theme for your website. If you are using any other theme, please let us know your suggestions in the comment section below!